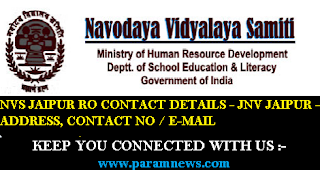 The Jawahar Navodaya Vidyalaya JAIPUR , since its establishment, has been continuing its efforts in imparting modern and quality education to the selected rural children of the district. JNVs are fully residential and co-educational schools affiliated to Central Board of Secondary Education (CBSE), New Delhi, with classes from VI to XII standard. JNVs are specifically tasked with finding talented children in rural areas of India and providing them with an education equivalent to the best residential school system, without regard to their family's socio-economic condition. 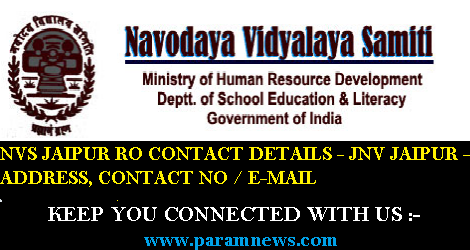 NVS JAIPUR RO CONTACT DETAILS - JNV JAIPUR - ADDRESS, CONTACT NO / E-MAIL. The Jawahar Navodaya Vidyalaya JAIPUR , since its establishment, has been continuing its efforts in imparting modern and quality education to the selected rural children of the district. JNVs are fully residential and co-educational schools affiliated to Central Board of Secondary Education (CBSE), New Delhi, with classes from VI to XII standard. JNVs are specifically tasked with finding talented children in rural areas of India.